In 2011, nearly every producer I saw in the Côte Chalonnaise and the Côte de Beaune had crémants on offer. Such was the case at Jean-Baptiste Ponsot's excellent Rully domaine. When I asked him if I could try it, he begrudgingly reached for a bottle, adding, "If you want to taste the best crémant in the region, you should go up the road to Vito Alberti. They are, by far, the best producer in the region." "Vito Alberti," I thought, "Sounds more like a mobster or owner of a pizza parlor in Brooklyn. But producer of fine sparkling wine in Burgundy. Nah. Impossible!" After tasting Jean-Baptiste's rich yet mineraled Rully, I made my way up the road to the place whose name seemed more apt to produce prosecco. After introductions were exchanged, I learned that the name of the domaine was actually Vitteaut-Alberti, a double-barreled name that came from the combination of the domaine's founders, Lucien Vitteaut (not Vito) and his wife of Italian origin, Maria Alberti. Lucien and Maria Vitteaut began released their sparkling wines in 1951. The savoir-faire and quality of production of these sparkling wines enchanted a local clientele of restaurants and private buyers from Chalon-sur-Saône to Beaune, allowing them to compete and develop against their rivals. Through plenty of sweat labor, sales rose to 18,000 bottles a year. In 1968, Lucien and Maria's son Gérard and his wife Danielle entered the Vitteaut-Alberti business with the objective of increasing production. Their personalised customer service created loyalty amongst clientele and allowed the sales development of their Vins Mousseux de Bourgogne throughout France to over 30,000 bottles. During the 1970s, equipment was modernized (with a new bottling line, mechanical disgorgement machine, and new labeling machine) within a new winery. With production increasing all over the region, winemakers began creating a charter that would later serve as a blueprint for the region's appellation application. The AOC Crémant de Bourgogne was created in 1975 and established the rules for making the Burgundian sparkling wine. Due to stringent standards, the Vitteaut-Alberti name became recognized for its quality and sales continued to mount. 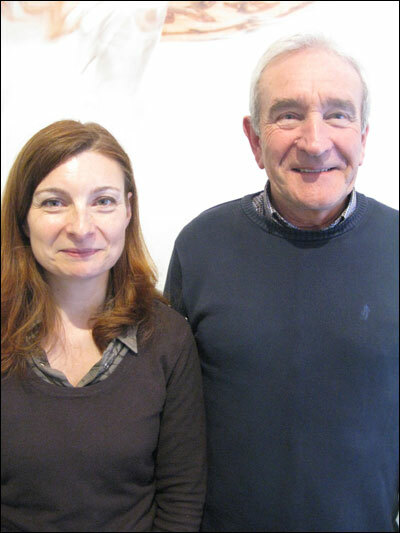 Gérard and Danielle decided to plant new vineyards so that they could further control their base matter. New investments including the construction of a second air-conditioned winery to accommodate a new pneumatic press and new temperature-controlled stainless steel tanks. By 2002, sales had reached 300,000 bottles, now sold not only in France but also in a number of export markets. In 2004, Agnès Vitteaut, daughter of Gérard and Danielle, joined the family business after completing studies in Law and Enology. The same year, the Maison Vitteaut-Alberti constructed a new building that allowed them to control all phases of production, including pressing, fermentation, blending, aging, riddling, disgorging, labeling, and packing, under one roof. The company increased its vineyard holdings in 2009 to total almost 13 hectares of vines situated on the Côte Chalonnaise and the Hautes-Côtes de Beaune. Near Beaune, the soil is a mix of clay, marl, and limestone that helps bring both minerality and finesse to the Chardonnay variety. 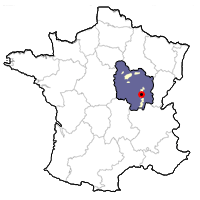 Within the Côte Chalonnaise, their vines are situated between the villages of Rully and Mercurey. The clay-limestone soil helps deliver more power and complexity to the base material. Vineyards are worked using the lutte raisonnée charter (sustainable viticulture) in which treatments are carried out as the vines need them and not in a systematic fashion, so as to control the quantities of chemical substances and limit their negative impact on the environment. The vineyards have grass that grows between their rows to further promote healthy soils and natural competition for the vines. In this way, while respecting the environment, the family is able to obtain healthy and balanced raw materials. In Rully and throughout Burgundy, harvesting for crémants takes place before the harvest for table wines. All of their grapes are harvested by hand. The clusters leave the vineyards in small boxes so that the crushing of berries and oxidation of musts is avoided. The grapes are normally pressed within an hour of picking in pneumatic presses with 50hl capacities. After the must settles, fermentation takes place, stimulated by dry yeasts. Vinification takes place in temperature-controlled, stainless-steel vats. All of the wines pass through their malolactic fermentation in tank. The base wines are aged on their lees for the whole winter, during which time the wine begins to acquire its character. The diversity offered by multiple vineyards allows for increased personality and complexity. While tasting the still wines and putting together the different cuvées, some vin de reserve, produced in previous years, may also be blended to further enhance character. The bottles then rest sur lattes in the cellar, where they gain in complexity. Before the wine is closed in bottle with a crown cap, a liqueur de tirage (sugar, base wine, and yeast) is added. A secondary fermentation takes place over the next few months, during which time the internal bottle pressure reaches approximately 6 bars. 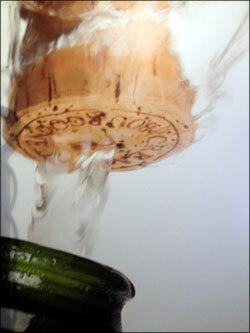 Bottles are riddled to bring the sediment due to fermentation into the neck of the bottle. Afterwards they are flash frozen and the sediment is ejected, leaving the wine clear and brilliant. Before inserting the final cork, a tiny bit of concentrated grape must is added known as the dosage which helps to balance the wine's acidity. 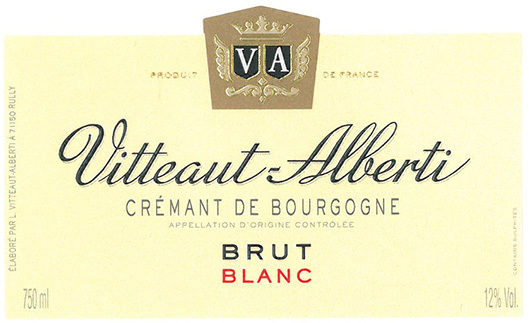 Vitteaut-Alberti Crémant de Bourgogne is ready to be savored! The top cuvée of the domaine was first bottled in 2006 and named after Agnes Vitteaut, currently in charge of production at the house. It is made with 100% Chardonnay, harvested by hand in vineyards with the Côte Chalonnaise and the Côte de Beaune. The wine develops all its aromas and acquires its typicity during a minimum aging period of 18 months. It has a delicate pale gold color, fine mousse, and minuscule bubbles. Tasting Notes: Notes of crisp apples, meyer lemon, and delicate limestone minerality surface on the palate. Great balance and finesse that one expects from a very good blanc de blancs champagne. Great as an aperitif or with light hors d'oeuvres. This sparkler is fashioned from 100% Pinot Noir, aged on its lees for 18 months and given a 9-gram dosage. It shows notes of bright red fruits, a tender toastiness, and a clean, appealing finish. Another high-quality release that over delivers for its price. 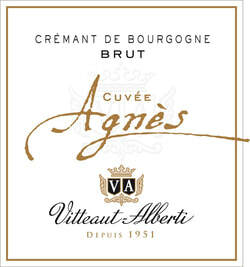 Vitteaut-Alberti makes great Cremant de Bourgogne from their small winery in Rully. This new release is something rarely seen in these parts, a blanc de blancs sparkler made with organically-grown Chardonnay. It is bright and clean, with a dry, crisp and thoroughly satisfying finish.